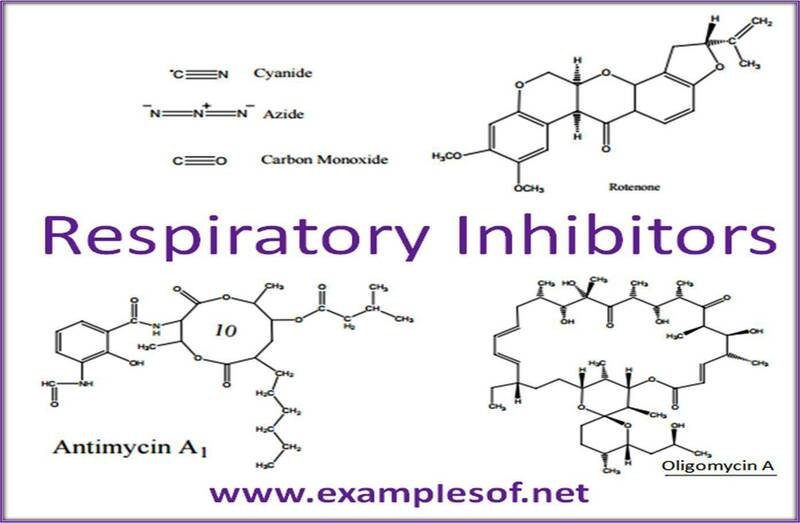 Respiration is the most important process of all the living beings in which oxygen enters into the cells and oxidizes various food substances (carbohydrates, proteins and fat )The compounds or chemicals, which inhibit respiratory process are called respiratory inhibitors. a) Inhibitors of Electron Transport: They include Rotenone, Piericidin A, Barbiturates, Antimycins, Dimercaprol, Cynides, Azides, Hydrogen Sulphide (H2S) And Carbon Monoxide (CO). b) Inhibitors of Oxidative Phosphorylation: They include Oligomycin, Rutamycins, Atractylate and Bongkrekate etc. d) ionophores of Oxidative Phosphorylation: Ionophores promote transport of cations other than H+ through membrane. The important ionophores are valiomycin, Gramicidin A and Nigericin.